I’ve heard it said that it is darkest right before the dawn. I am not sure if that is true. It seems like dark is dark. I think that the saying is true for a woman, in Uganda, that we had told you about previously. Grace is an incredibly strong woman. She is the wife of a pastor that was recently (September) struck by lightning and died. She was left with 10 children that she is taking care of. Some of them are hers by birth, some of them she has taken in. They range in age from 13-17. That seems like a high hurdle to clear. But it gets darker. We had known about Grace and her plight for a few weeks. We had mentioned her in this blog. We had arranged for our friend Cate to come to Mbarara, while we were there, to help us minister to Grace. We felt that Cate was uniquely qualified as her husband was a preacher before he passed away, at a young age, leaving Cate with 2 young children. 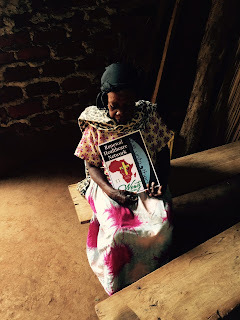 When we arrived in Mbarara on Friday, we found out that Grace was in………PRISON. That’s right. The woman that God had laid on our hearts was in prison. What could the widowed preacher’s wife done to deserve prison? It seems that Grace and her husband had joined with several people to take out a group loan. 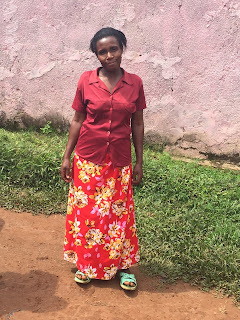 Grace was slowly making her payments and still owed 20,000 shillings (about 6 dollars). The group, however, still owed 6 million shillings ($2,000) and some in the group were not making their payments. The whole group was responsible for the loan, so since the group was in default, they all were arrested last Monday (December 7th). So Grace was not only widowed and trying to raise 10 children, she had now been in jail with her kids at home for 5 days. 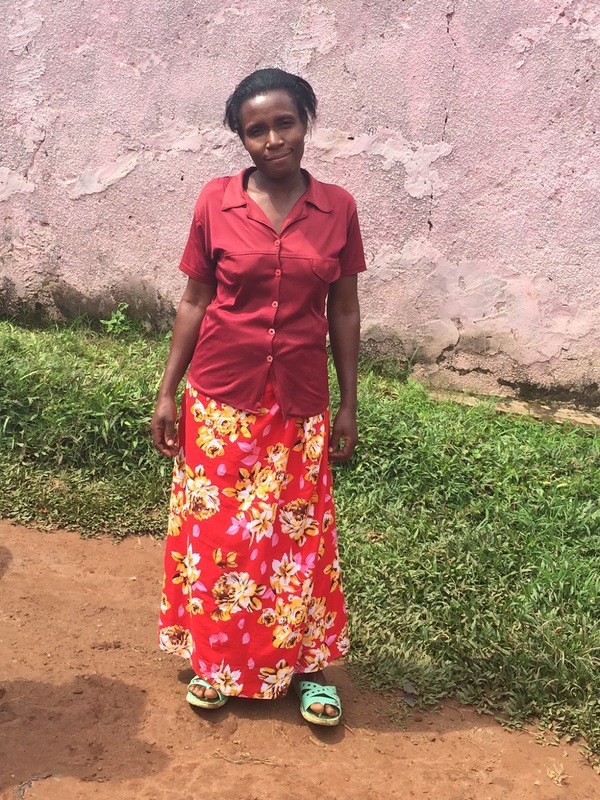 Our friend, Pastor Joseph, was able to inquire about Grace and was told that it would take 2 million shillings (about $650) to gain her release, even though she only owed 20,000 shillings. Even this could not be done until Monday the 14th. We were heart-broken for this lady. Just when things seemed dark, it seemed like this blow could leave her without hope. This whole situation was heavy on my heart all weekend. I woke up very early on Sunday morning thinking about this lady and her situation. It seemed like God gave me the word “pilgrim” in my heart. I was not sure what that meant, but I was sure that God had placed it on my heart about Grace and her situation. As I did some research, I came up with several definitions, but wondered how they applied. On Monday, Pastor Joseph was able to hire an attorney and gain her freedom without paying the entire 2 million shillings. Today, Tuesday, Jill and Cate were able to go and visit Grace and her family at their home. As they talked with her, they found out that Grace had not lost hope. She had taken the “opportunity” of being in jail to be an evangelist to the other women there. Despite her circumstances and despite the dark valley she was traveling through, she was preaching the love of Jesus. Wow! We had come with intent of ministering to her and she had given us a great example of ministering to others. With this information, my “pilgrim revelation” seemed to make more sense. One definition of pilgrim is a person that is traveling in a foreign place. I think prison was a foreign place for Grace. The people there were not like her. 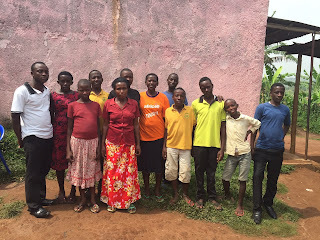 As I had stated in the previous blog, we had hoped to raise enough money to help the widow with school fees for her children, potentially buying a plot of land and constructing a house. We had started towards that goal, but we had to use some of the funds to get her out of prison. The next set back was that she has many more children than the 3 that we thought she was caring for. Even though the project has become bigger, we feel that God can use us to help this amazing Grace in her time of need. 1.) Raising funds for school fees for those children still attending school. We will post pictures, names and a link to how you could sponsor one of these children for their school fees. 2.) Raising funds to purchase a plot of land. The way we understand it at this time, we can find a small plot of land for about $2,000 (that is US dollars). We have been made aware of a plot of land that is 2 acres in size and already has a “plantation” of banana trees on it for about $9,000. This is obviously a big amount of money, but it would be something that could provide some sustainable income. 3.) Raising funds to help in the construction of a home. This might be less than my original estimate of $5,000. Some local churches and pastors might be able to donate labor and supplies to help with the construction. The family also does already have a few construction supplies and metal sheets to make a roof. All of the work could be purposeless. 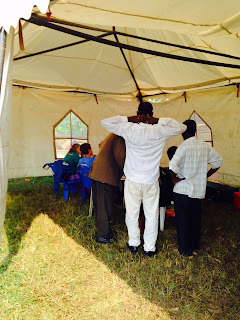 We have started into our eye clinics in Southwestern Uganda. On our first day we saw 160+ people and found 18 patients in need of an eye surgery. We treated many others with reading glasses, eye drops and allergy medicines. 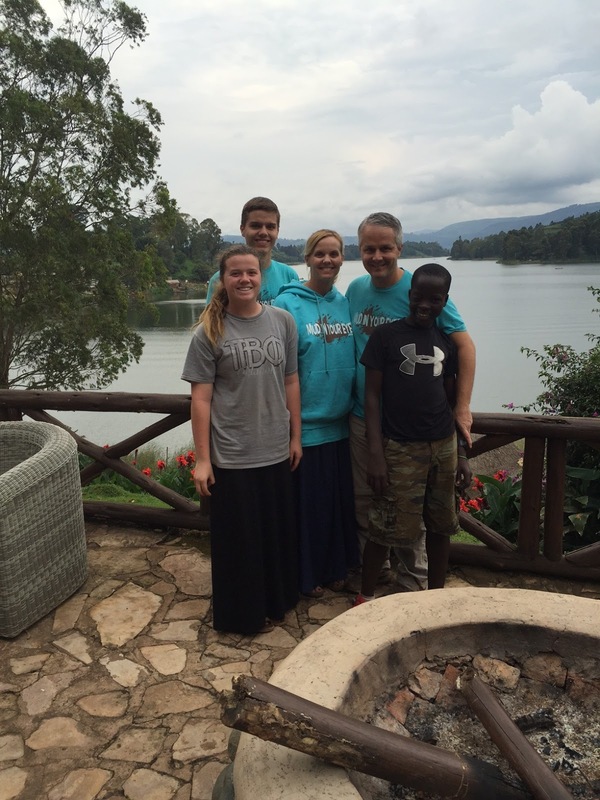 We traveled with 9 people on our team and were joined by about that many more from the local church in Kabale. Much work was done and many people were treated, but was our toil purposeless? 1 The words of the Teacher, son of David, king of Jerusalem: 2 "Meaningless! Meaningless!" says the Teacher. "Uttery meaningless! Everything is meaningless." 3 What do people gain from all their labors at which they toil under the sun? 4 Generations come and generations go, but the earth remains forever. 5 The sun rises and the sun sets, and hurries back to where it rises. 6 The wind blows to the south and turns to the north; round and round it goes, ever returning on its course. 7 All streams flow into the sea, yet the sea is never full. To the place the streams come from, there they return again. 8 All things are wearisome, more than one can say. The eye never has enough seeing, nor the ear its fill of hearing. 9 What has been will be again, what has been done will be done again; there is nothing new under the sun. 10 Is there anything of which one can say, "Look! This is something new"? It was there already, long ago; it was here before our time. 11 No one remembers the former generations, and even those yet to come will not be remembered by those who follow them. How is that for a pick me up blog? The writer of Ecclesiastes is lamenting how everything is meaningless.............. without God giving us purpose. So our work that we have done, is not in vain. It has everlasting purpose. Through our clinic on Tuesday, about 20 people came to know Christ (I am not sure of the exact number as the Pastor kept the list). Each one of those souls gives us purpose. Next week, 18 of these patients will receive surgery to restore or preserve their sight. Imagine the display of God’s love to these precious people, to their family and to their village with this change. That has purpose. Almost anything you do or that I do can have purpose, if we know Jesus and we work to bring him glory. Trying to find purpose in your life? His name is Jesus! Each eye surgery and surrounding care costs about $50.00. As we head to Uganda in a couple of weeks, our heart has been touched by a family there that we don’t even know. On September 28th, Pastor Joseph, from Mbarara, reported on Facebook that a pastor friend of his had been fatally struck by lightning. As our contact with Pastor Joseph is a little limited, we did not know much more about this heart breaking event until we met up with Joseph in Tyler. As we were spending the evening in Tyler, with Joseph, there was a pretty significant thunderstorm with lots of lightning. This lightning reminded us to ask Joseph about what had happened. It seems that a pastor from Mbarara returned to his home village to attend a burial. After the burial, while he was preparing to return to his church in Mbarara, he was struck by lightning and died. His death left his young wife and children without a husband, father, and bread winner. At this time, we are unsure of the children’s ages, but we think there are 3-4 kids, all in school. The family had owned some land and were planning on building a house. To help the church, the pastor had recently sold their land and used the money for the church. 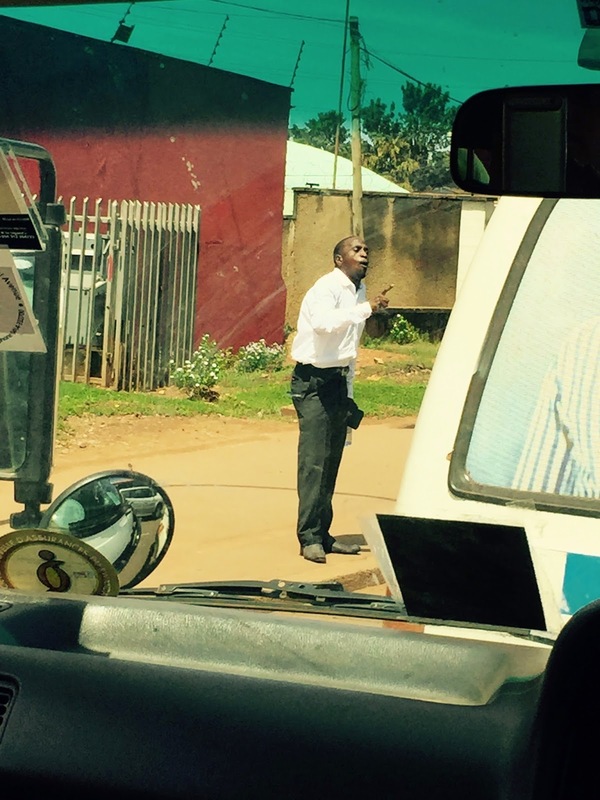 This type of sacrifice is not uncommon for pastors in Uganda. As many of you know, Mbarara is the city in SW Uganda that we have been basing our Mud In Your Eyes missions out of. The deceased pastor’s church is right on the road that we drive down each day as we leave our hotel there. As Pastor Joseph told us about the hardship facing this family, God touched our hearts about some things that we could do to show God’s love to them. First of all, we thought of our friend, Cate, that we stay with sometimes in Gaba. Her husband was a pastor, but passed away of a medical problem at a young age. His death left Cate and their 2 children in a very similar situation to this other pastor’s family in Mbarara. Her strength, faith and God’s provision over the years gives Cate a unique perspective and ability to share wisdom with this recent widow. We were able to talk to Cate on Tuesday and she has agreed to join us in Mbarara next month to help minister to this family. Secondly, we would like to ask you to start praying about possibly sponsoring one of the children of this pastor to go to school. We can arrange a school sponsorship for these kids through Parental Care Ministries. This is the ministry that we were introduced to in Tyler this month. For $35/month, one of us can sponsor a child in a way that helps them go to school, have food to eat, and clothes to wear. This is the link to the PCM website: http://www.pcmonline.org/pages/loving-children/sponsor-a-child/ If you are interested in helping us on this front, please contact me and we will arrange for the sponsorship. The children that we are trying to help are not listed on this website but will be profiled in a blog in the second or third week of December. Thirdly, we would like to raise the funds to buy back the family’s land that the pastor had to sell to support his church. According to Pastor Joseph, a plot of land will cost between $3,000 and $4,000 USD. If we can secure this parcel of land back, we can move to the 4th idea. Lastly, the family had been living in the church building. As the church will be finding a new pastor, their ability to stay in the church is drawing to a close. They are going to need a place to stay. As a way to support his church and ministries, Pastor Joseph has built a kiln and makes bricks used in construction. 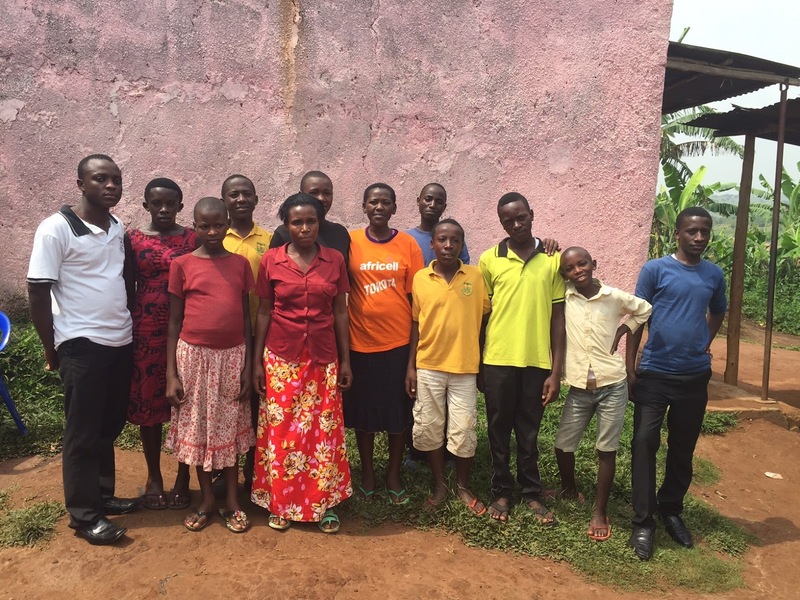 We would also like to raise enough money to build the family a small home on the newly purchased land. I am not sure of the price for this project but I will estimate it at $5,000 USD. Please pray about these projects and see if God might prompt you to give toward one of these specific projects. You can contact me directly via email at DueUnto@gmail.com. 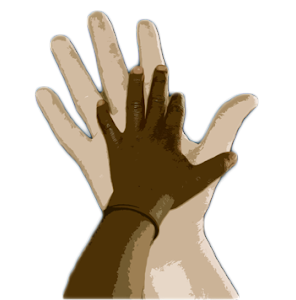 We have exciting news as we have completed the formation of our non-profit organization. You can now give a tax deductible donation directly towards our mission projects. Every dollar of any donation goes directly toward mission projects as we have no overhead or paid staff. Another bit of good news involves Jamil. He was having some humming in his left ear, back in August. This prompted us to go ahead and have his MRI done. We got the results of this last week. As many of you know, he has multiple tumors inside his head. None of these tumors have changed in size! We were blessed by this news and also by the news that the humming in Jamil’s ear has gone away! We leave for Uganda on December 2nd. We plan to do one week of eye clinics in a rural area of southern Uganda. Following this week of clinics, we will host a week of eye surgeries for the people that we have identified in the clinics. Each one of these surgeries, to repair vision, costs a total of about $50. This includes the surgery, travel to and from the hospital, meals at the hospital and travel for follow up care. We observed God’s love spreading through villages last summer as we hosted similar projects. You can see more about our eye ministries, Mud In Your Eyes, in this VIDEO DOCUMENTARY. Thanks for all your support through prayer and giving toward these specific projects. Each year, as we host our medical clinics, we are greeted by many patients as we arrive for our day’s work. We have devised methods to try to keep the process of checking in patients orderly. One method is to hand out number cards to the people that are present when we arrive. This insures that they have their “ticket” to get seen for the day and don’t get displaced by someone more aggressive that shows up later. In the past, these number cards were sharpie numbers written on a note card. At times, when some of the note cards were lost, we had random pieces of cardboard numbers. We noticed last year that some of the cards became forged. We even had people buying forged numbers to get a place in line. Also, we had to put the cards back in number order prior to each clinic. This got us thinking, that there had to be a better way. It needed to be something that could not be duplicated or forged. I had thought of something as simple as poker chips with numbers written on them. As we thought about this, we came back to what we know is the most important element of the clinics. That, of course, is sharing the gospel with the people that come to the clinics. As we thought through this, God began to give us an idea for our number cards. Then, as the idea came together, he helped us find someone to produce them. Each card is a full size sheet of paper that has been laminated. On one side, it has the Due Unto Others logo, the Renewal Health/Wentz logo and a number. These cards are numbered from 1-200 as we average about 200 patients per clinic. 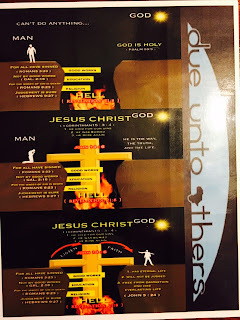 On the other side we have 3 pictures and bible verses that can lead a person through the gospel presentation, even if they can’t read very well. Picture #1 shows a man that is separated from a Holy God. It demonstrates that good works, education and religion cannot bridge the gap between man and God. - Romans 6:23 “For the wages of sin is death, but the gift of God is eternal life in Christ Jesus our Lord”. 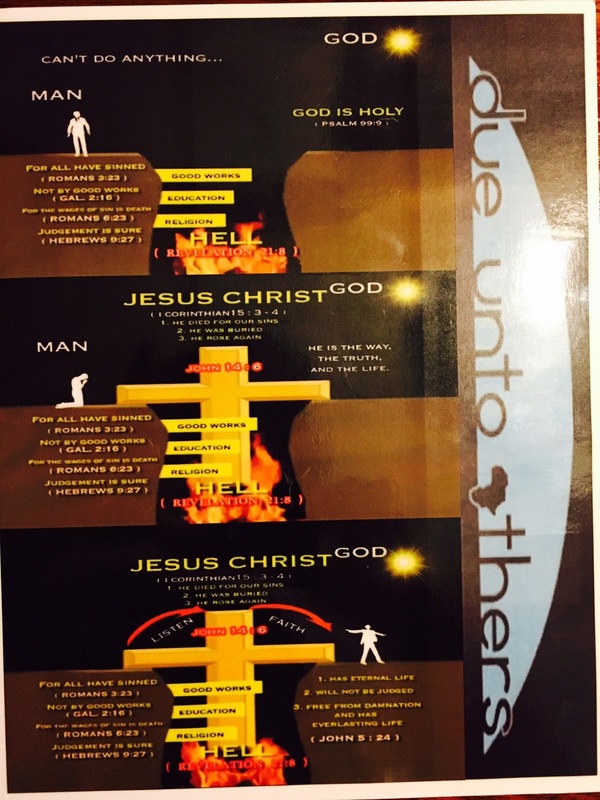 Picture #2 shows a cross coming in to the gap between man and God as a bridge to God. - 1 Corinthians 15:3-4 “For what I received I passed on to you as of first importance: that Christ died for our sins according to the scriptures, 4 that he as buried, that he was raised on the third day according to the scriptures”. - John 14:6 “Jesus answered, ‘I am the way and the truth and the life. No one comes to the Father except through me”. The third picture shows the man crossing the “Cross Bridge” to reach God. The man now has eternal life, he will not be judged, and free from damnation. - John 5:24 “Very truly I tell you, whoever hears my word and believes him who sent me has eternal life and will not be judged but has crossed over from death to life”. As the patient is waiting for their medicines, one of the pastors goes through this card with them. Then they are allowed to take the card home. Hopefully to share with others. 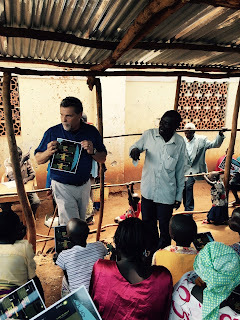 These cards have been universally well received, have helped to lead many to Christ and we hope they will be a witnessing tool in each of these villages for years to come! We are coming down the home stretch of our Mud in Your Eyes mission trip for 2015. We have 1 clinic remaining in Migina on Friday. We have scheduled 56 people for eye surgeries next week. About 50% of these are cataract surgeries. It has been interesting this year. The people that we have discovered, while working clinics, that needed some extra medical care, have almost exclusively been people with eye problems. When we decided to emphasize eye care this year, I thought that we would mainly be finding and treating people with cataracts. We have found many people with cataracts, but we have also found other eye problems. So in addition to offering surgically restored vision to Ugandans, we are also preventing vision loss to others. It is going to be amazing on Monday morning. All of the people that we have determined that needed a surgery, will show up at the eye hospital at 8:00 am. At this point, this number will be at least 56, but potentially as many as 70 people, getting care that they could not get otherwise. Hospitals do not feed the patients or take care of the patients beyond medical and nursing care. So our main job for next week will be trying to help feed and coordinate the transportation of these 70 patients and their one family member that they bring along to help them. Please continue to keep our team and these patients in your prayers. We are "counting" on it. 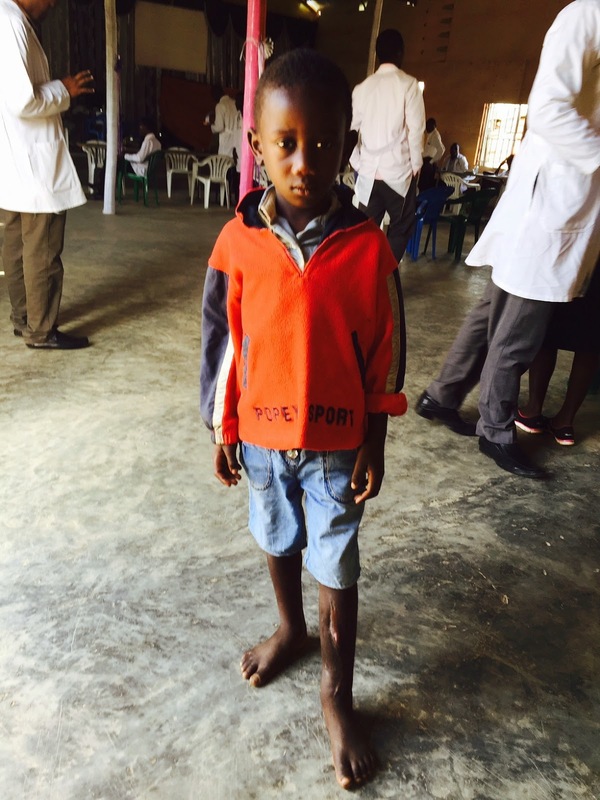 When we arrived at the clinic in Ishaka, I, like Jay, was taken a back by the difference a year can make. It had already been a great start, because we had talked to Jamil, and you could hear the excitement in his voice with the start of school. 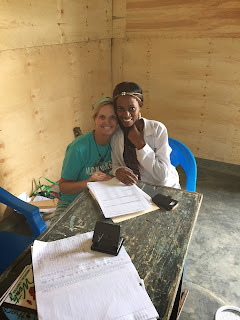 As we began setting up, I was introduced to the young lady who would be my interpreter where the patients check in. Her name is Shamira. Every clinic is a little different. At Ishaka, there were so many waiting outside under the tent, that we would call about 10 at a time after the first 30 so the inside of the church was not too congested. The pauses as we waited to call each group gave us time to get to know one another. Ishaka is where Kampala International University Medical School is located, so we had many medical students to help us each day. Shamira is a first year medical student from Kampala and introduced herself as muslim. She said her friends had talked her into coming to Ishaka Community Church on Sunday. She heard there would be a medical clinic at the church from Monday to Wednesday so she wanted to come and be a part of it. Sunday was the first day she had not worn her niqab, the head covering worn by muslim women. This one she wore only allowed her eyes to be seen. She shared with me that her father is a muslim, but her mother is a Christian as well as her four other siblings. I told her I thought Jesus was pursuing her heart. She agreed. We talked about Jesus for a little bit and I asked her what was keeping her from accepting Him as her personal Savior and Lord? She said, “Nothing is.” I asked her if she wanted to accept Him now? She was and did! I asked her if she had a Bible, and she said she did. It was noticed in the picture that was taken of the two of us on Monday, that she had fixed her hair to cover her a lot like a niqab would. I asked the Lord specifically that she would understand the freedom she now has in Him and would be more comfortable with not using her hair as a covering. We serve an Amazing God who answers specific prayers. Tuesday’s Picture!!! I asked her on Tuesday if she had talked to her mom? She said, “Yes, and she is very happy.” I asked if she had told her that she was now born again? She had. She was a joy to work next to. On Wednesday, we continued to talk and get to know each other. 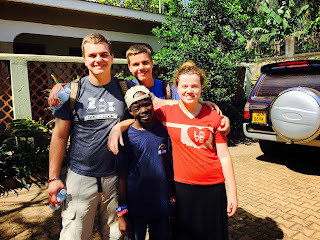 Our friend, Henry is a first year medical student at KIU as well. I had asked Shamira if she knew him earlier in the week. She didn’t and I only know his first name. But, when Henry arrived, she told me she did know him. He used to be her neighbor. Henry said, he thought she was a muslim. I told him she was, but she became a believer in Christ on Monday. I shared with her about how I had prayed for her to know the freedom in Christ. I showed her the difference in the two pictures. Please join me as I continue to pray for Shamira to become a fully devoted follower of Christ. I write this blog from the ministry machine as we make our way back to Mbarara. 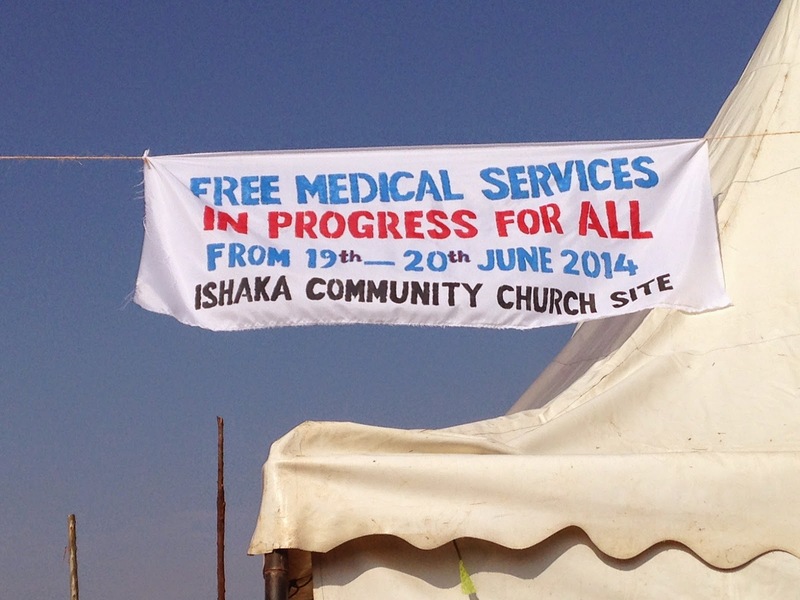 We have just finished our 3 days of clinic in Ishaka. 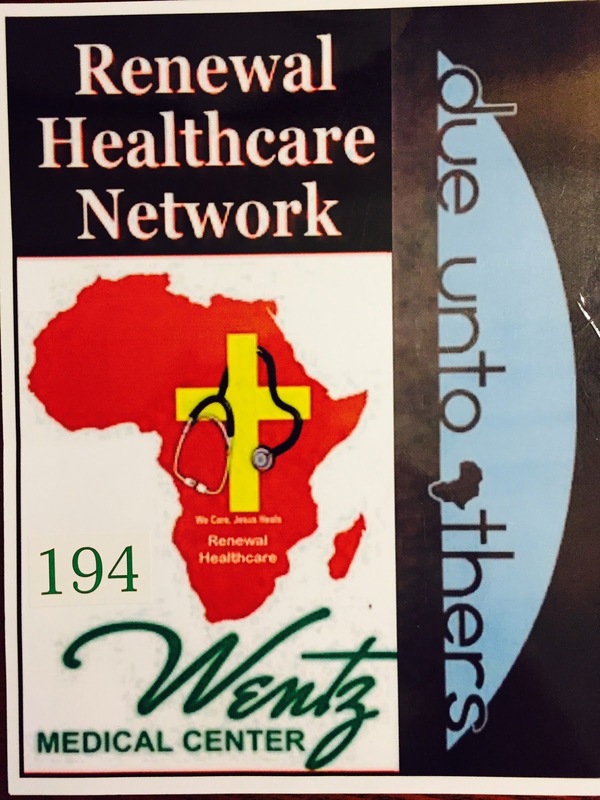 The Due Unto Others/Renewal Health Network/Call2Africa team has seen and treated over 730 patients, after which we are a little leg weary. Our spirits, however, are energized as we have seen more than 130 people give their lives to Christ. The Gospel was shared to groups, to individuals, through video and through a puppet show. Medical care was once again a magnet to draw people in, to hear about Jesus. As we live our lives, we sometimes don’t appreciate the changes that can happen in the span of 1 year. 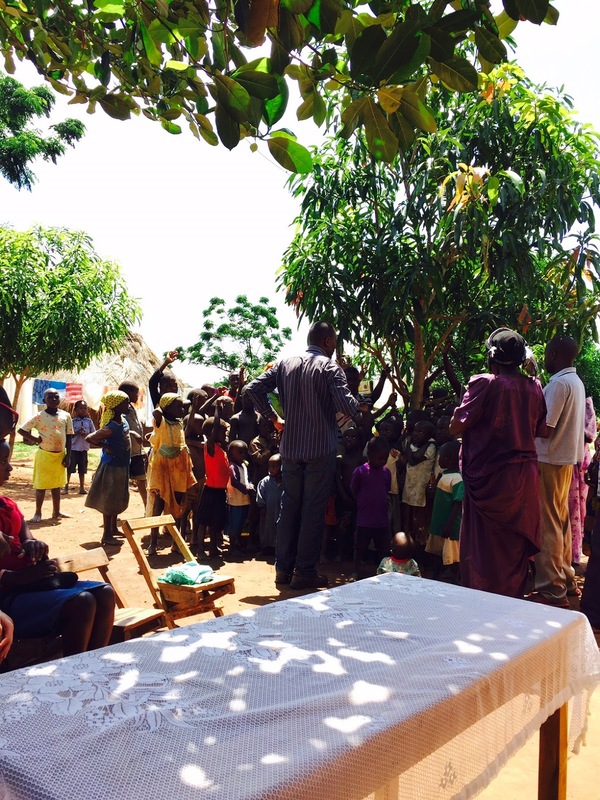 Our team has seen the huge difference a single year can make this week in Ishaka. 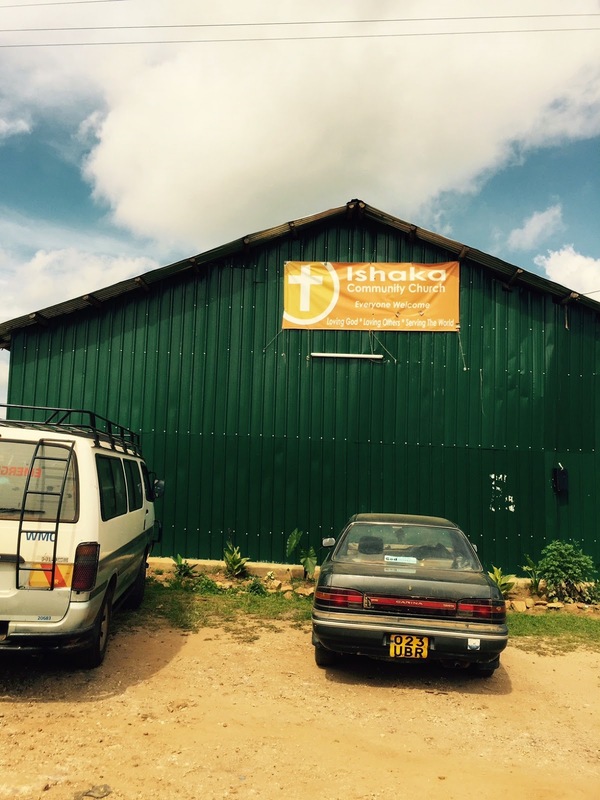 Ishaka Community Church is almost unrecognizable approximately one year after we visited them in 2014. 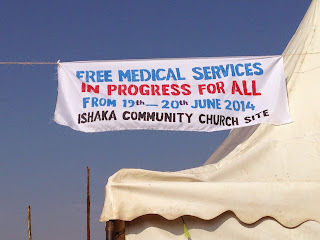 You might recall this blog that I wrote about the Ishaka medical clinic last year. As we arrived to start our clinic this week, we noticed a nice metal building with a concrete floor. Last year, we worked out of a small tent on uneven ground. We even had to scramble for cover when a rainstorm came and almost collapsed the tent. Ishaka Community’s Pastor, Sam, told us that he does not think that the church would have gotten started without the medical clinic that we hosted last year. 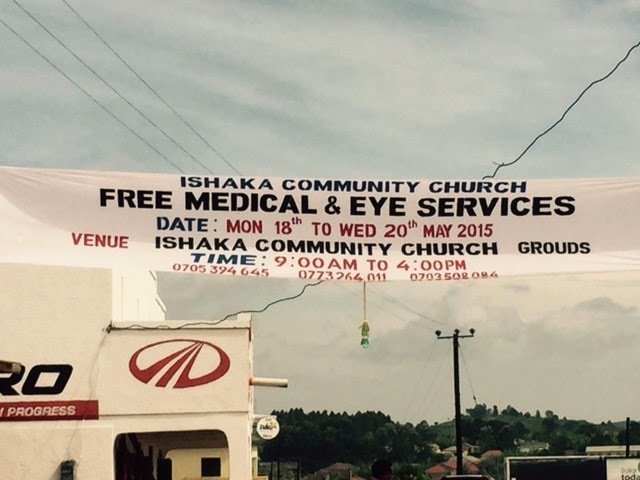 Our clinic in 2014 was one week before the church opened. Sam says that almost all of their original members came from that 2 days of clinic. Ishaka is a community with a heavy Muslim influence. The district did not want the church to start, but the initial momentum of the church allowed it to succeed. What a difference a year has made for Crispus. You might remember this photo from last summer. When we saw Crispus, she had been severely burned and her foot was scarred up against her leg. 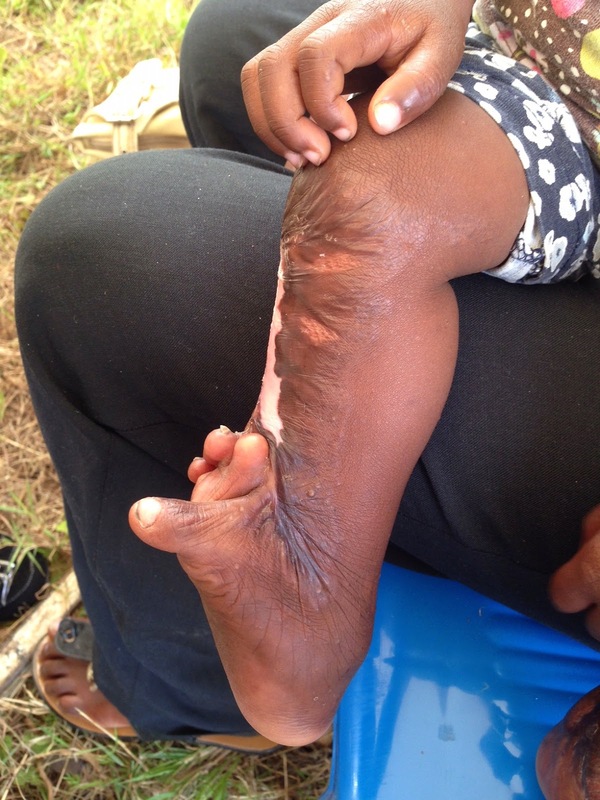 She was unable to stand or walk because of the scarring and contractures of the foot. Through God’s provision and Due Unto Others donors, Crispus was able to receive multiple operations to relieve the scarring and contractures. When we arrived on Monday, Crispus RAN out to greet us! What a blessing to see a child given a second chance at a normal life. 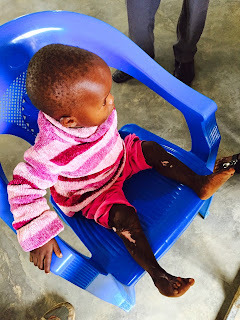 Some of her scars are starting to get tight again as she grows, so she will be meeting us in Mbarara tomorrow to have some more surgeries done. 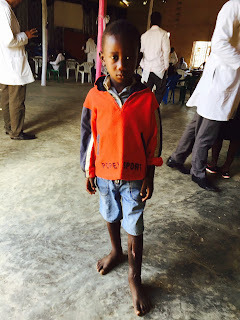 Thank you for your prayers and support that has helped Crispus. The last 12 months have proven to be a dramatic change for Gift also. We had seen him last year and he had a horrible bone infection of his lower leg. It had pus draining from it and he could barely stand. I was quite concerned that the leg might require amputation. Again, through multiple surgeries and IV antibiotics, Gift was healed. He greeted us when we arrived the second day. Through our God’s healing power and the efforts of many, Gift has gone from a horrible infection that threatened life and limb to being a healthy boy in one year! Just one year ago, Mud in Your Eyes was just a “vision” that God had given me. It was on this same drive back from Ishaka in 2014 that we discovered and met Dr. Simon. Dr. Simon is an Ophthalmologist that teaches at Mbarara University Eye Hospital. 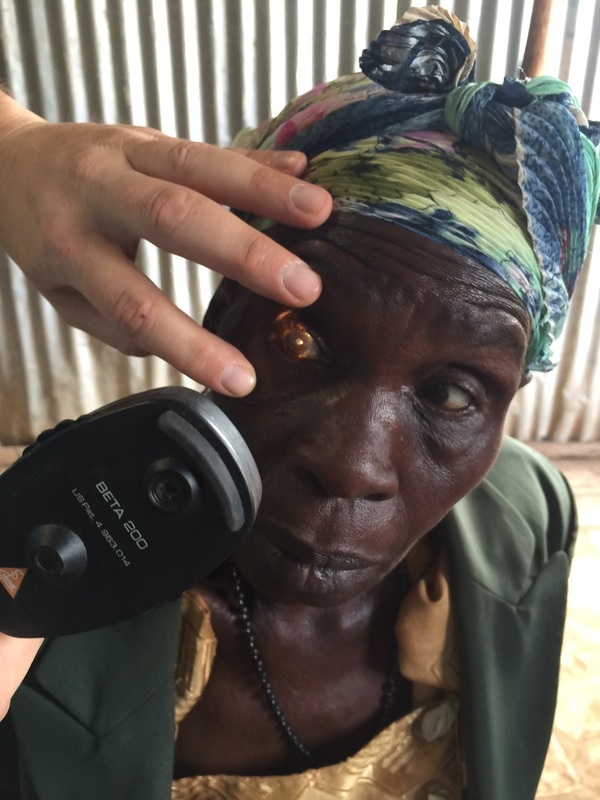 Part of our emphasis, during the past 3 days, has been to find people with cataracts that could be repaired surgically. 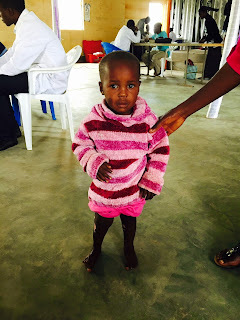 Dr. Simon sent an Ophthalmology clinical officer (like a PA in the USA), named Grace, with us every day this week. He has identified 20 patients that need surgical intervention. About half of those are cataracts, and the others are anything from glaucoma to possible tumors to inverted eyelids that need repair. So in turning the pages of one calendar, Mud in Your Eyes has been launched in Uganda. I regret not getting a picture, but near the end of the clinic today, we saw an old couple. In fact, the lady had received a number to be seen but the husband had not. After we noticed him, we sneaked him in the back door to get Grace to look at him too. Alfred and Queen will be traveling as a couple to Mbarara on June 1st for an evaluation for cataract surgery. What a blessing it will be to them. Can you imagine the demonstration of God’s love that will be witnessed by their whole village! 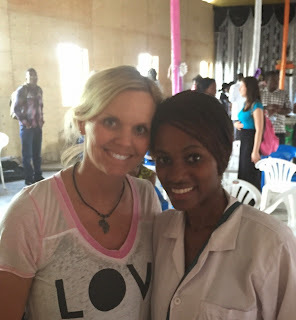 We have 6 remaining clinics as we continue with our mission trip of 2015. Our number one goal will be to share the Gospel and allow the Holy Spirit to win souls for God. After that, we will continue to look for That One Person that we can make a difference for medically. Please continue to pray for our team and those with whom we interact over our remaining clinics. There’s power in the Mud! Is my grief due to my unbelief? We are currently in the Ministry Machine making our way to Mbarara. We will be hosting clinics there for the next two weeks, then spending a week coordinating cataract surgeries for those that God brings our way. As I make this trip, I have to admit, I am a mess. 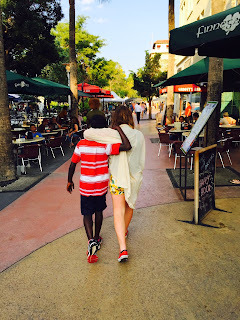 Today we left Jamil with our friend David and Jamil will start his boarding school tomorrow morning. We have purchased all of his supplies and paid his fees. Even though we will see him again in 3 weeks, there is some finality to today that struck me while we were in church this morning. Since then, my “allergies have been acting up”, as Jill likes to say. Only this time, I am not sure if there is enough Benadryl and steroid shots to set me straight. I am grieving for our family that our time with Jamil in our home is over. I am grieving for Jamil that his time with our family is over. At the same time, I do believe that it is God’s plan to return him to Uganda and get him back in school. 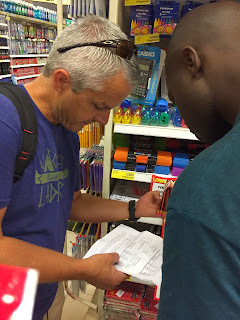 Knowing that it is God’s will for Jamil to stay in Uganda, helps my brain to feel better about our separation today, but it so far has not helped my heart. I believe in God’s plan, but does this grief show my unbelief? I catch myself grieving over Jamil’s diagnosis of a brain tumor and Neurofibromatosis type 2 (NF2). I grieve even though these things have been stable with no growth for at least 9 months. I grieve the fact that the life expectancy for patients with NF2 is around 30, even though I know my God is in the business of doing miracles. I grieve that there are no surgical options for Jamil’s brain tumor and that if it starts to grow, the medical treatments are limited. I believe when I pray for Jamil’s healing, but does my grief show my unbelief? Please review this passage from Mark 9. I currently see myself in the father in this story. He believes that God can heal his son, but at the same time he asks for help with his unbelief. Dear God, I know that everything is possible for one who believes. I pray that Jamil’s transition back into Ugandan boarding school be as smooth as possible. I also pray that Jamil grows old while doing your work. I pray that his longevity, as an NF2 patient, will be talked about in text books. Lord I do believe; help me overcome my unbelief! They went across the lake to the region of the Gerasenes. [a] 2 When Jesus got out of the boat, a man with an impure spirit came from the tombs to meet him. 3 This man lived in the tombs, and no one could bind him anymore, not even with a chain. 4 For he had often been chained hand and foot, but he tore the chains apart and broke the irons on his feet. No one was strong enough to subdue him. 5 Night and day among the tombs and in the hills he would cry out and cut himself with stones. It is Wednesday evening here in Jinja, Uganda. We started our day this morning early. Our team gathered for breakfast and our morning “Devo”. No one had been specifically assigned to lead the devo this morning, so we weren’t sure exactly how it would go. While sleeping last night, I had a dream about the pigs at our ranch drowning. When I woke this morning, God brought this passage, in Mark, to my mind. If you have read any of my blog posts in the past, you know that I am not a biblical theologian. So the devo I lead this morning and what I am about to share with you may seem extremely bizarre to you. 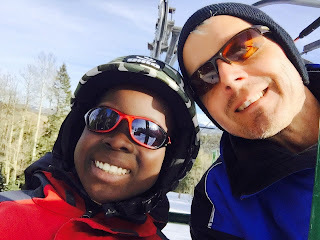 Through our discussions with Jamil, over the past weeks and months, we have come to find out that Jamil received some significant teasing, related to his eye, while at school. This even after the tumor had been removed and with his right eye remaining permanently closed. Jill and I have encouraged him to turn this source of ridicule into his badge of honor for Jesus. His eye is a testimony to God’s mercy and power in his life. 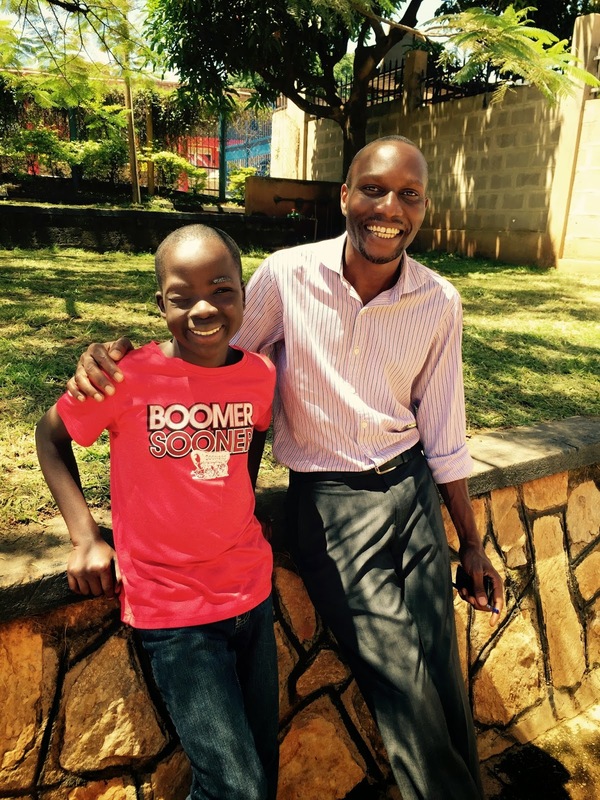 When he starts to school this next week, it will officially be the second term (out of three) for the 2015 school year in Uganda. He will be joining a class where most of the students were already there for term one. Since he will be a “new student”, he will be asked to introduce himself to the class. We are going to be coaching and encouraging him to share is life story with the class. 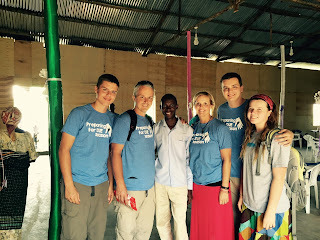 We feel that this will provide a great platform for him to share Christ with others. Today, when we took Jamil back to his home in Pallisa, Pastor Jonathan Kabanda asked for 10 minutes to talk to the people that had gathered to see why the Mzungus had come to the village. Jonathan asked Jamil to stand. Then in the local language, shared Jamil’s story of God’s healing, provision, and grace. He talked to the gathered crowd about Jesus and His power. When he was finished, 19 people raised their hand to accept Christ and then prayed a prayer of salvation. If this didn’t prove a point to Jamil, he must not be paying attention! God impressed on me how much this man who was healed by Jesus had in common with Jamil. Jamil had been shunned by his village. With his large eye tumor, the villagers felt that he was cursed. 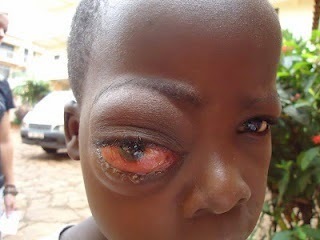 They would not allow him to be in school because his eye and the way it protruded, scared the other children. He was an outcast. Then Jesus caused a chain of events to happen. 1.) A traveling evangelist saw Jamil while holding a crusade in Jamil’s village. This was at the same time that Jamil gave his life to Christ. 2.) That traveling evangelist also takes jobs as a driver to make money to support his ministry. 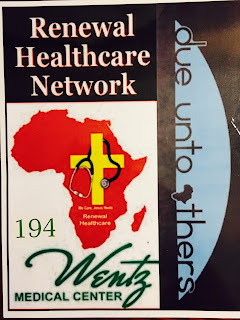 This driver/evangelist was hired by a medical missions team from Oklahoma to drive them on a few missions. 3.) The evangelist and the mission team from Oklahoma became friends and he told the team about a boy with an “eye problem” that he had seen out in Pallisa. 4.) The medical team was able to meet Jamil a few weeks later. 5.) People from all over the world, but especially Duncan, Oklahoma, raised funds for Jamil to have 2 separate eye surgeries and radiation. 6.) God provided for Jamil to go to the USA for a final diagnosis and ultimate plan of action. God has caused a healing in Jamil and if Jamil has on his sunglasses, you would not know that he has ever had a medical problem. The people, especially in Pallisa that knew him before, are AMAZED at what God has done in Jamil’s life. Though we may want Jamil to return with us to the USA and Jamil may want to go with us, we feel that God has commissioned him to "go home to his own people and tell them how much the Lord has done for him and had mercy on him. We will continue to encourage Jamil to share his story and through the amazement, he can share Christ with others. Tomorrow is our first clinic of this year's mission. We are excited. As we began to realize that the Lord was leading us to bring Jamil back to Uganda, He reminded me of this scripture. I know what it feels like to be divided. Divided between two very different cultures. Not physically of course, but emotionally, mentally, and spiritually. This is a very tough as an adult. It is even harder to see it in your child. Yet, Jamil is alive, healthy! We have been homeschooling him in math, reading, and English, studying science and social studies as it came up in our reading. I came to realize the division of this sweet child beginning as we worked on these subjects and lived life with him in the US. I will never forget the day in August when we found out that the MRI showed the tumor was in his brain. At that point, we had yet to see Dr. McNall at OU Children’s Hospital. To our knowledge at the time, we believed the tumor had grown from the CT scan in June he had in Uganda. We assumed from the knowledge we had at this point that our call was to walk along side this sweet child as he beat us all to Heaven. I knew I could not give this news to Jake over the phone. So a sweet friend went with me to Weatherford that late afternoon so I could tell Jake in person. God is teaching me I must trust Him more deeply. To remember He is the Alpha and the Omega. He knows way more than I do. I am to walk by faith not by sight. God continued revealing Jamil should be in Uganda in several ways. We sought council from strong Christ Followers who listened carefully and the Lord used them to confirm His leading in our hearts. 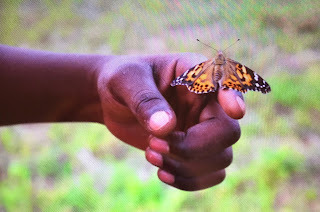 For Christmas, one gift Jamil received was a butterfly kit. When the weather became warm enough, we ordered the caterpillars. This gift became a visual reminder of one of the verses he has memorized. 1 Corinthians 5:17-“Therfore, if anyone is in Christ, he is a new creation, the old has gone, the new has come.” We talked about our hearts are like the caterpillar before we come to realize we need a Savior. When we realize the only way to have eternal life is by accepting Christ, He transforms our heart….the old has gone and the new has come. The result of the change (like in the cocoon, yet in an instant not days) is a new creation….the butterfly. The butterfly can never go back to being a caterpillar. The reason we choose to do good is because of what Jesus has already done for us on the cross because of grace that we each must choose to accept personally. As we choose to live by his Holy Spirit daily, the new that is sealed in our hearts (the butterfly) it points others to Jesus, gives God Glory, and builds our treasure in heaven where thieves and moths cannot destroy. The butterflies had been out for about 5 days. One Sunday evening: Jared, Jayne, and Jamil came and asked me if they could go and release the butterflies. It was a cloudy evening. Jayne took her camera and took a few pictures. Upon their return I asked if I could see the pictures. As soon as I saw this picture, it was at that moment the Lord confirmed to me that His plan was for Jamil to return home to Uganda. It was time to release him. However, I will admit to you that I continued to want Him to confirm it. I had looked up the verse the first time that I began this blog with in Jay’s ESV Study Bible many weeks before. I decided after seeing that picture and a couple of others I wanted to look it up in the One Year Bible I have been reading through which is in the New Living Translation. I have enjoyed God’s Word in this way as it goes by date with readings from the Old and New Testament. When I looked up in the index for the verses in 1 Kings 3 it was on June 8th, the day return to the airport to head back from the recently scheduled trip to Uganda. Really, Lord? This is when I knew that I knew what He was saying. Doubt and questions still kept creeping into my thoughts. I am thankful and praising God who is merciful as He sees our hearts. I wanted to obey, but oh I had no idea this new level of emotional pain that was beginning in me. God’s lesson: Trust me more deeply. Faith is believing without seeing. Finish well while I have your child physically with you. It was a few days we received a letter stating that Jamil’s travel documents had been issued. A week or two after that we received the date of his immigration interview for May 6th. We had already scheduled our return to Uganda from May 8th to June 9th. Okay Lord, I know what I heard you say, what does this mean? As I have followed Christ I have learned He does not lead us in straight lines. Is this a new turn, a curve from Him or not? The need for daily discernment increased as did my emotional sadness. But, the underlying peace remained. I will admit sometimes it would shake if I would take my eyes off the Only True Source of Peace. But, by grace, He restores when I refocus. Unfortunately, sometimes I choose to do this more slowly than other times. We had decided while Jamil was with us we wanted him to experience the ocean. (Most Ugandans do not love the water for swimming.) 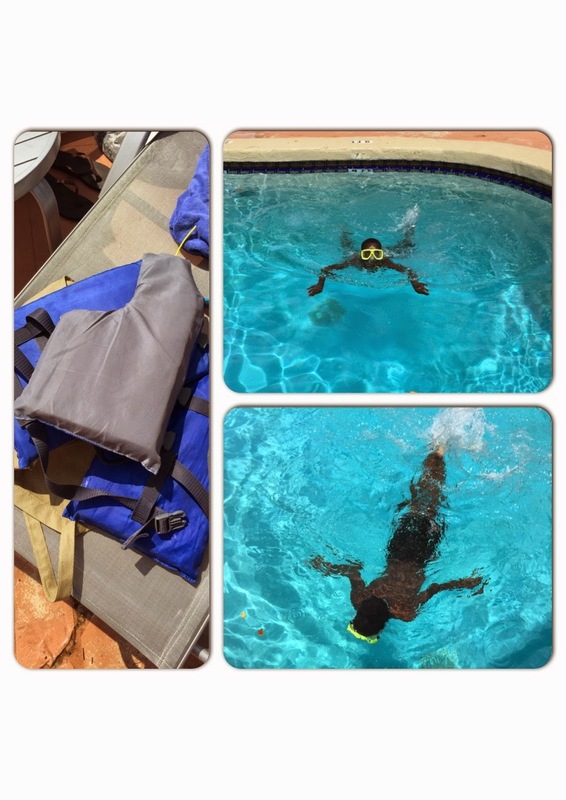 Last June, the first swimming pool Jamil was around in Uganda, he jumped in with both feet! No fear. As I write this I realize just how much in hindsight this is who he is. Well, he sank. We were right there. He continued in his time with us to be very willing to experience new things. When he arrived in the US we quickly got him a lifejacket and he always wore it around water. This particular morning in Florida, I was the first one up. His life jacket was on the table. As I noticed it, my heart broke yet again and my eyes flooded with emotion as I thought about returning from Uganda without Jamil. Later that morning we were at the pool. Jayne and I had been teaching him how to swim. I noticed that his life jacket was in the chair next to me. Jamil was swimming! No life jacket required. Just like the butterfly picture, the Lord spoke through His Spirit to my heart. He doesn’t need the life jacket. I Am and always have been and will continue to be. “I’ve Got This”, God! I think, NO, I know, this Uganda trip has been the most difficult to prepare for: bittersweet. Usually, I have an idea of what we are doing with the understanding it is a liquid plan. However, as we were preparing to leave, I felt that I was going in totally blind. Our first several days were planned to look at the best school for Jamil to attend upon return. It is very different sending your child to school approximately 8500 miles away compared to 200, not to mention difficult to comprehend. Monday, May 11th was the day we planned to begin looking at schools for Jamil near Gaba a suburb of the capital of Kampala. Gaba is where we work from through Africa Renewal Ministry who we partner with in the mission work God has called us to in Uganda. Jay, Jamil, Cate, and David had looked at a couple in August when Jay returned to get Jamil last summer. I believe with all my heart, this is why I didn’t sleep more than 4 hours Sunday night. I am thankful for all of you who prayed for us as we began this unknown journey Monday morning. I have been reminded several times by a dear friend to remember in the dark the decision that was made in the light. God did not disappoint. As I was awake Monday morning, I kept thinking about how I wanted Jamil to be close enough to Gaba Community Church so he could attend there each Sunday. We had talked with David Gitta, and he offered to pick up Jamil when he was available. David’s willingness to be a big brother to Jamil and Cate’s willingness to be a mother figure to him in Gaba had brought comfort. God is so faithful. Monday morning about 8:30 am David arrived at the guest house and we went to pick up Cate. The first school we went to tour was Bunga Preparatory School. Jamil’s countenance was somewhat apprehensive. In August they had looked at this school’s other campus, which is actually where the boarders stay as well as P5-P7 classes are held, which he had liked. A gentleman, named George, came up and introduced himself and let us know that he would show us the boarding area at the other campus. This is when I first noticed Jamil beginning to relax. He, Jay, and Cate had looked through the windows in August, and Jamil had been pleased. In the US, when we began talking with Jamil about returning, it was the school of his first choice. Jamil stayed at the school to interview and take an exam, to determine his placement. We met George during this time at the boarding campus. Jay and I were very impressed with George and his passion for the school and the children. He explained that his goal would be to make sure Jamil would feel comfortable. Jamil would be paired with a leader in his class. George would not allow others to make fun of Jamil, because of his eye. He suggested the best beginning for this would be for Jamil, as a new student, to share his story and experience. 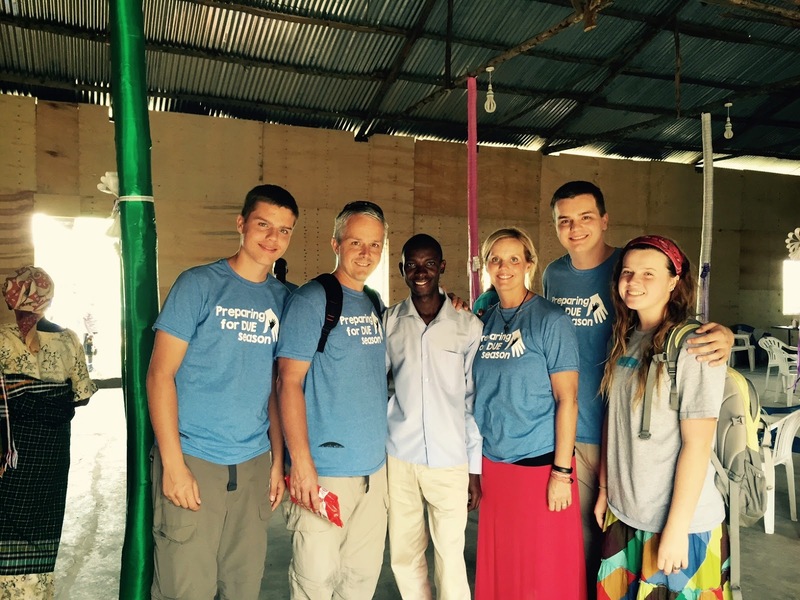 His parents had begun this Christian based school and he had returned to help them. There are three matrons who live on campus and George is there. This campus is located right down the road from Wentz Medical Clinic and Gaba Community Church (GCC). It is one of the few boarding schools that will allow the children to leave with a specified adult for the weekend. Perfect! George can take Jamil to GCC for the 11:30 service each Sunday and David, Cate, or one of our other extended family from there can return him to campus by Sunday evening. The school also allows the child to be picked up on Friday and returned on Sunday evening by designated adults. We all agreed there was no need to look at any other schools. We had found it. God is so good. Later Monday evening we had a dinner meeting with most of the members of the Wentz Medical Board that Jay is now a member of. Pastor Peter was there and had read Jay’s blog. He asked how our day had gone. When we shared, he said his children had gone to that school when it was only a kindergarten. It was a great school, and he knows the people who own it very well. He stated, “They are very good people.” God has answered. 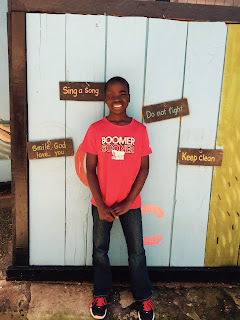 As I finish this blog, Jamil is taking another exam to best determine his level in this school. David and our family have been gathering the supplies Jamil needs to move in Monday and begin school on Tuesday. 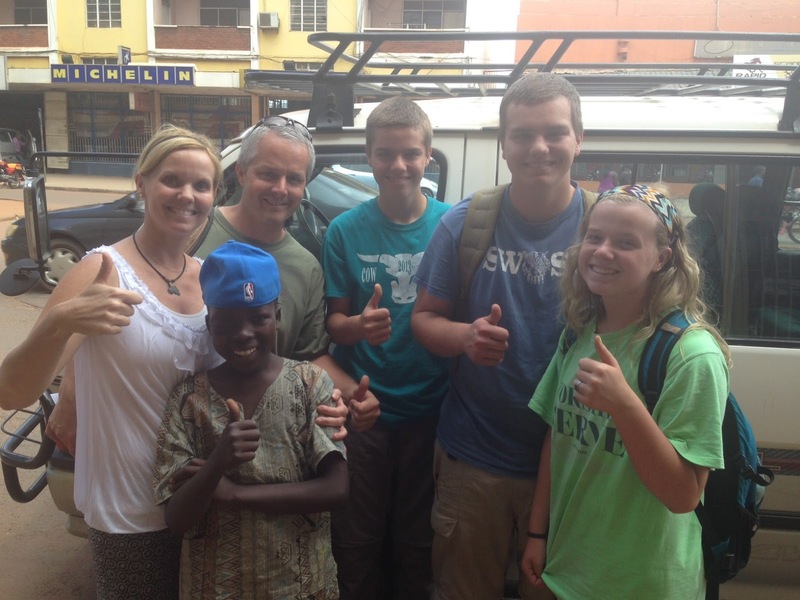 We will leave in a few hours for Jinja and head to Palissa district for Jamil to visit his family until Friday. Jamil will rejoin us when we head back to Gaba. We will have two clinics in Jinja on Thursday and Friday. One will be at an orphanage and the other is an area that has just experienced severe flooding where a few people died. I’m sorry for the delay of this blog, but I did get a full nights sleep after being up for 21 hours. (It reminds me to appreciate and respect the fact that Jay stays up so often as he provides for our family and beyond.) I know the days will still be hard and sad at times for not only this mother, but for all of us who have come to know and love Jamil. As his mother, I want him to live. I know the Lord loves Jamil even more than I do and has a perfect plan for our son. He will remain whole and undivided!